All Posts Tagged With: "Pout"
Pout is a celebrity adored makeup brand from London created by three girlfriends Emily, Anna and Chantal. 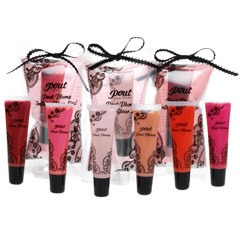 Pout Plump by Pout is the ultimate lip plumping gloss. Pout Plump is infused with peppermint creating a cooling sensation to your lips. Other ingredients found in Pout Plump: Maxi-Lip TM a unique ingredient that hydrates your lips and increases collagen with regular use. Pout Plump comes in 6 hot shades like: Original, Caramel, Bubblegum, Pimento, Forbidden Fruit and Mulberry.